The Sock Monkey Blog keeps you up-to-date with all the new monkey business happening here at Funky-Sock-Monkeys.com. You'll see whenever any new Web pages or changes appear on the site. You'll be informed about all the new sock toys as they arrive and all the many fun sock monkey items that are available out there. Continue reading "Sock Elephant - how to make stuffed elephants with red heel socks "
Continue reading "Free Vintage Sock Monkey Patterns and Instructions "
A fun monkey craft to build a pair of red heel socks into a stuffed toy sock monkey doll. Free sock monkey pattern and sock elephant pattern and ideas for other sock animals. Continue reading "Free Sock Monkey Pattern and Instructions "
Learn how to make a sock monkey and other cool sock animals by hand with these easy to follow patterns and step by step instructions. Buy red heel socks and sock monkey kits. Continue reading "How To Make A Sock Monkey - Free Sock Monkey Pattern and Instructions"
Make a super cute dancing sock monkey doll with pink ballet slipper knee high socks. Fun ideas, photos and tips on how to craft sock monkey dolls from funky socks. Continue reading "Dancing sock monkey, Free Patterns For Sock Crafts"
Sock monkey stuffed animals, learn how to make your own funky sock monkey toy. Grab some sock monkey socks, follow the pattern and you'll be hugging your socks in no time at all. Continue reading "Monkey Stuffed Animals, Handmade Sock Money Doll"
Fun monkey sock craft project. Free sock monkey pattern for making sock animals. You can vary the pattern to make any sock animal you'd like. Continue reading "Monkey Sock Doll, Easy Sock Crafts "
How to make a cute monkey sock doll, free easy pattern and directions. Make a handmade baby sockmonkey doll with hat from any socks you chose to craft them from. Continue reading "Monkey Sock Doll With Hat , Striped Pattern Socks"
Free instructions to make a funky sock monkey toy. 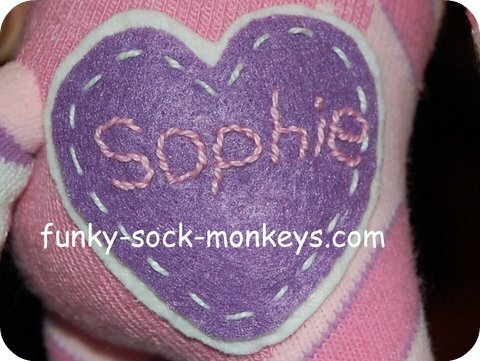 Easy to craft hand made sock toys, great for monkey lovers. Continue reading "Funky Sock Monkey, Hand Made Toy Patterns"
Sock monkey fabric: you want sock monkeys, you got it! Fun, bright, and ever so sock monkey-ish prints by moda, suitable for curtains, cushions, bedding, and many other funky monkey sewing projects. Continue reading "Sock Monkey Fabric, Funky Monkey Print Fabrics"
Sock monkey party theme ideas and supplies. Find cake pans for monkey birthday cakes, baby showers, invitations, favors, plates, cups, napkins and much more. Continue reading "Monkey Party Theme - Sock Monkey Balloon"
Make yourself a genuine handmade sock monkey toy with original Rockford Red Heel Socks. The sock elephant and sock monkey instructions are included in the packaging. Available in brown, pink & blue. Continue reading "Rockford Red Heel Socks - Original Sock Monkey Socks"